Technological progress in machining sheet metal has made it possible to design and install increasingly modern, fast and productive machines. CAMU, in combination with its own cutting lines, designs stacking and packaging solutions that are suitable for the needs of every single customer and increase their efficiency and competitiveness. Automation with well-calibrated processes is of absolute importance in order to obtain well-strapped and palletized products, especially in the case of delicate materials. 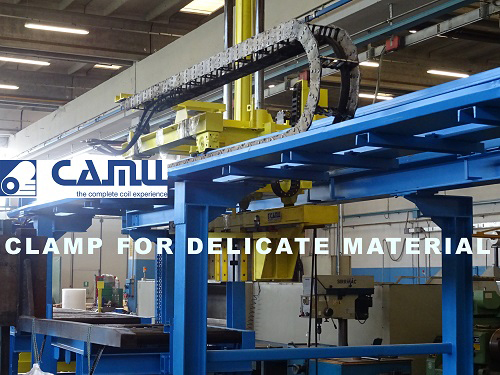 With its experience, CAMU is able to study specific solutions on the basis of needs and the type of material. Some solutions are illustrated below. 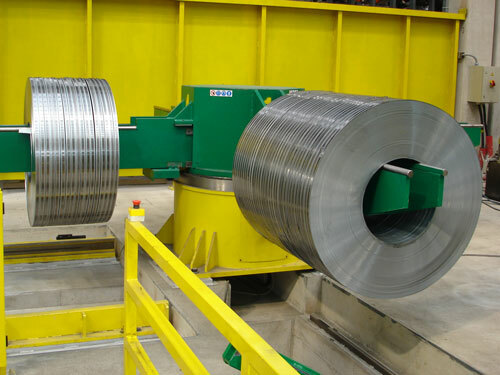 These constitute the final stage of the machining process in slitting lines.These systems are for picking up each single coil, strapping it radially and stacking it with the formation of a pile. The piles of coils can be evacuated directly, strapped onto pallets, packaged, weighed and labelled on the basis of individual needs. The flexibility of these systems makes it possible to assemble the finished product in different ways, thereby obtaining multiple combinations such as in-line piles or star-shaped ones. 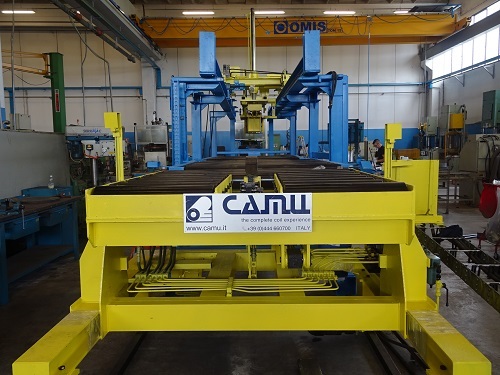 For modern steel-work service centres, CAMU proposes the automatic circumferential strapping machine up to 40 strips positioned on the unloading turnstile. 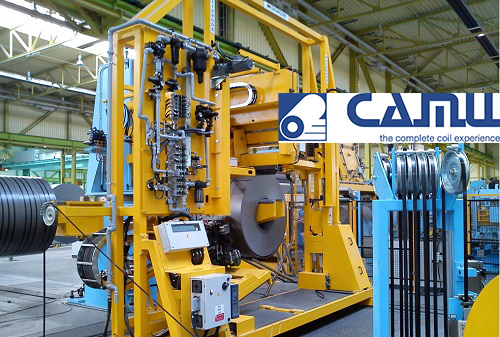 This system permits the quick restart of the Slitting line and reduces downtime because the operation is made out of the mandrel. These constitute the final stage of the machining process in cut-to- length lines. The sheets are stacked and can be packed, weighed and labelled in accordance with the use, needs and dimensions requested by the customer. These operations are carried out in a completely automatic manner and in complete safety in order to obtain finished packs ready for shipping. This has very simple characteristics and places one sheet above another by sliding after cutting. This is the simplest and most economical solution, but applicable only for materials that do not require particular attention. Recommended for ferritic and non-delicate materials, its cost is reasonable and the stacking speeds range up to 100 m/min. This is designed for collecting one sheet at a time and placing them one above the other by dropping them vertically, without damaging the surfaces. This type of stacking is indicated for delicate materials such as stainless steel and prepainted and aluminium ones, but it is now also being used for sheets of carbon steel. This system makes it possible to prevent surface scoring that is unaccepted by the quality system of various companies. In some cases it is also used as it generates less noise than other stacking systems. A very versatile system, recommended for all materials, but with a stacking speed up to 50-80 m/min. 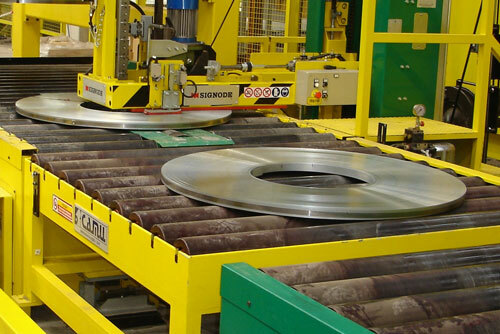 Stacking takes place by means of a series of magnets combined with a high-precision, high-performance system which, by placing the sheets by dropping them vertically, prevents surface scoring. Recommended for systems for high speed stacking up to 100 m/min and ferritic materials such as carbon steel. This is used when high volumes are required and therefore it is particularly suitable for service centres, steelworks and industries. 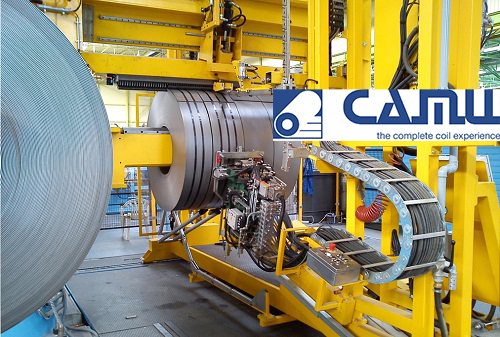 It consists of vacuum systems around which a conveyor belt rotates, collecting the metal sheets and conveying them quickly and efficiently to the opposite side. 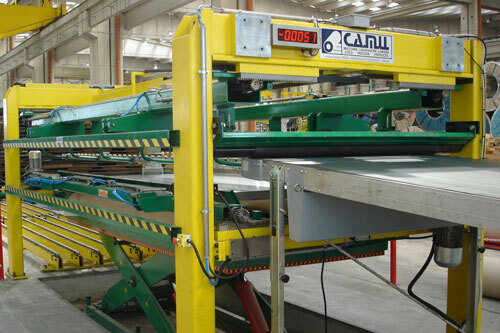 The conveyance speed of the sheet is closely related to the conveyor belt rotation speed. 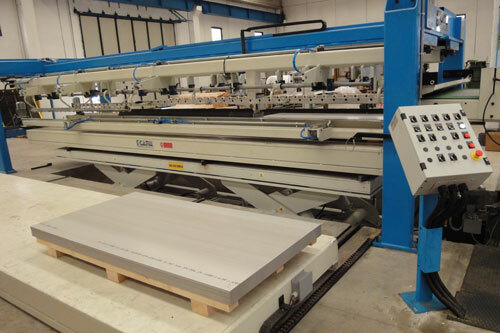 Recommended for high-speed systems and suitable for stacking delicate materials and sheets with particular shapes, such as trapeziums and discs, at stacking speeds up to 100 m/min. Used when medium volumes of delicate materials are required, this consists of a metal structure to which suction cups are coupled so that the single sheets can be lifted in a precise manner. Recommended for plants for producing medium volumes of cold-rolled and delicate materials, and also for stacking sheets with non-rectangular shapes and speeds up to 20-40 m/min. Studied and designed for optimizing the work cycles of the stackers, this system makes it possible for operators to avoid heavy and hazardous manual operations and guarantees the maximum flexibility, safety and, above all, productivity.